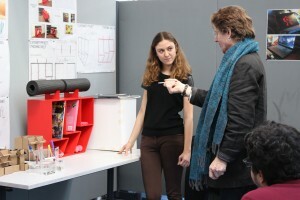 The Art and Design Foundation students have had their final critique today for the Container Project. The students were asked to design and produce a container which could be used to house a special type of object. Each container had to be made from materials which were readily available and the container must fit inside a cube of 600mm. During this project, students were encouraged to identify and overcome any problems they encountered. Each student kept a diary of their progress and developed a range of ideas through different mediums: drawings, collage and model making. Once they had chosen their final idea, each student made their container and presented their finished project to the group. Yasemin produced a stretching shelf to fit in her student accommodation and enable her to keep all the gym equipment she has tidy. She designed shelves for her dumbbells as well as shelves for her books and DVD’s. An interesting addition to Yasemin’s design was the top section of her container which was she designed to hold her gym mat.